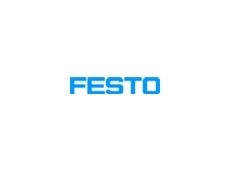 A new Festo guide, EnergyEfficiency@Festo provides several tips on maximising energy savings in pneumatic production processes. 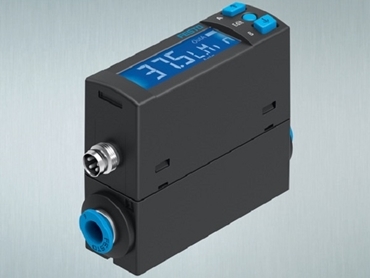 The SFAH flow sensor from Festo allows for easy and cost-effective monitoring of compressed air use. Featuring an intuitive user interface with high output flexibility, the flow sensor gives a clear picture of your energy usage. Combining high flow dynamics with a compact design, the SFAH flow sensor has been developed to measure non-corrosive gases and air. 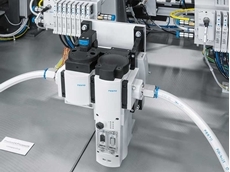 Festo’s SFAH flow sensors are designed for use in the general automation market, but particularly suited to applications involving small parts picking, consumption monitoring, air gap checking and leakage detection. Operating at pressures between 0.9 bar and 10 bar, the SFAH offers an extended flow measurement range from 0.002 l/min to 200 l/min. Key features and benefits of SFAH flow sensors include accurate and reliable readings; robust design reducing susceptibility to disruption by particles and moisture; choice of straight, angular or rotatable pneumatic connectors offering great installation flexibility; user interfaces common across Festo’s entire flow and pressure sensor range, simplifying commissioning and installation; high level of in-built flexibility thanks to switchable electrical outputs including NPN/PNP, NO/NC and IO-Link that are easily selected from the intuitive menu; digital and analogue outputs; and direct programming via intuitive ‘teach’ buttons on the unit, or by using an IO-Link master and selecting parameters via a computer or PLC. Using the sensor with IO-Link, which stores all the sensor parameters, also allows for remote maintenance. If an existing sensor in the field needs replacement, the new sensor can be simply wired in and the IO-Link master can download the necessary parameters for operation. Additionally, the IO-Link master can offer a replication function for identical sensors. Just commission one sensor and copy the information to the rest; this eliminates the need to set up sensors individually, simplifying and speeding up maintenance, and reducing build and downtime. Each SFAH flow sensor is equipped with a high contrast, illuminated LCD colour changing display that provides a clear visual indication when the set parameters are exceeded. An inbuilt eco function ensures the backlight will only be on when the unit is in use or being interrogated, thereby saving energy, particularly where multiple sensors are used. The SFAH flow sensor is IP40 rated for use in general industrial applications and a range of accessories is available to protect the sensor in harsher environments.